Recently I've continued working on my old Ziba map (remake from Battlefield 3) for Soldier of Fortune II - Double Helix which I'd really love to finish as it's been in development for over 3 years now. Now my main issue is light. Both sun light as spotlights ( the ones on the ceiling as the ones outside against the walls are fake 2d lights). Sometimes the sun shadows look so nice,just like I want them but on other places they are just utter crap like they look like stairs. Inside it's even worse as whatever I do, the spotlights look blocky. Over the years I've read countless websites and searched compile options of other people. Mainly Hipshot, AEon, Obsidion, Cityy, AndyW, DaEngineer and Lunaran. And I did learn some of it. Now, I'm going for a pretty bright sunlight with the color thats going on about now but with detailed but blurred out shadows. But as I said before, its still pretty blocky and some weird zrtifacts on walls can be seen like at the upper floor outside against the wall. I hope some of you masters can help me finetune this to perfection for my map, as I'd really apreciate it ! Here's what I have assembled so far of a shader and compile options. I also tried it with a global lightmapscale between 0.25 and 0.75 but it's still not that great eventhough this might be one very important step to make it all look nice. Any hints or tips are welcome ! Last edited by KENNITHH on 03-01-2017 01:33 PM, edited 2 times in total. You are using dozens of q3map_sunExt lines? What is this good for? This looks really horribly difficult to tweak. 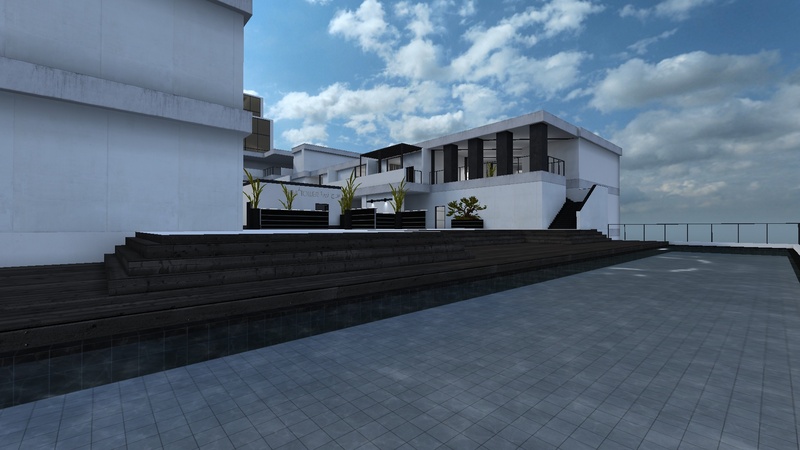 I've always only used it one time per sky shader for the direct sunlight and created my ambient sky light with q3map_skylight. 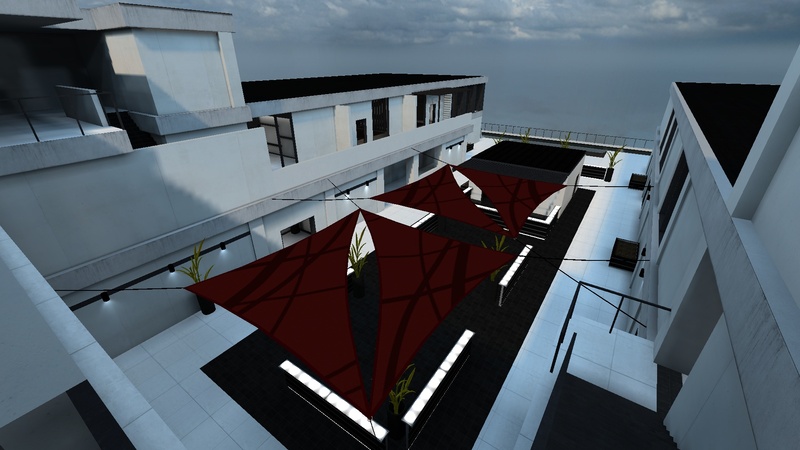 You can change the skylight color by using q3map_lightimage with a uniformly colored texture. Also, -samplesize 16 is the default size and does nothing. Try -8 and also write it in the LIGHT phase as well. You have to use it in the BSP and LIGHT phase to make it work. For testing purposes I'd add -fastbounce to the light stage. This will save you time until you have found the settings you like. 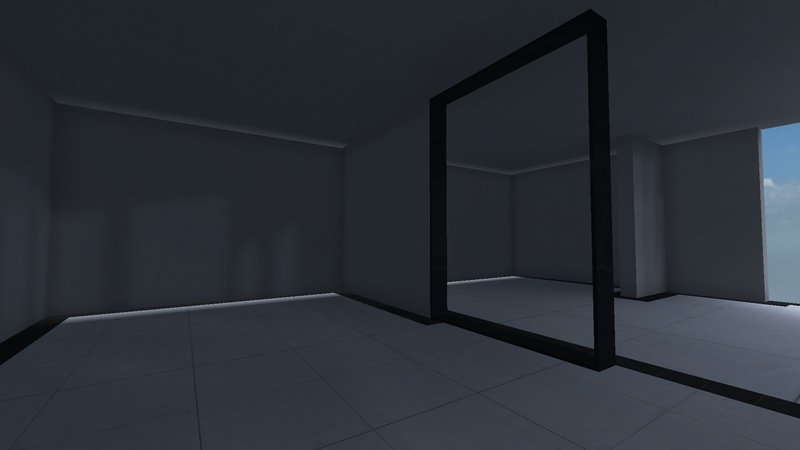 Unfortunately you can't really do anything against the varying lightmap resolution across different surfaces. 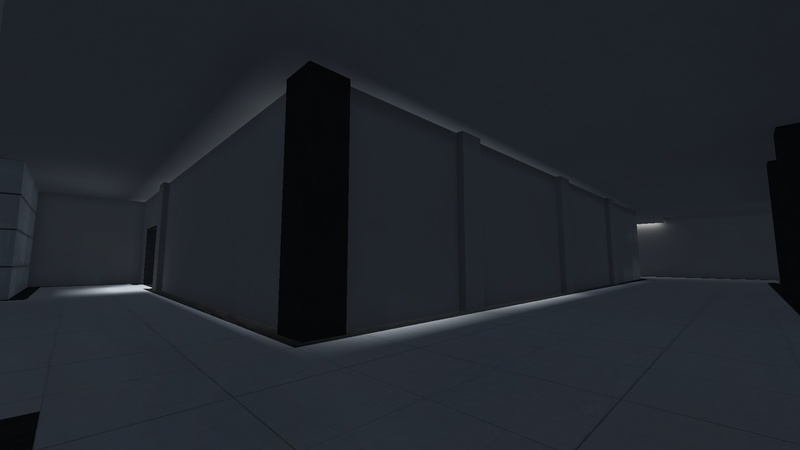 While you can use external lightmaps that are not written into the BSP to fix this, you'll lose the overbrighting which can make your lighting look flat. At least this was a problem 5 years ago when I used it for Shibam, maybe someone found a fix for it in the meantime. The sky shader is 99% from AndyW and Lunarans lun3dm5 map. I tested some sky shaders after mine was kinda plain and boring and this ones color looked pretty neat so I stayed with it for now until I manage to get the same kind of light color with only 1 sun. So I tested the things you suggested and the shadows do look better already, I thank you for that but Im not happy yet with the color and the inside. About the external lightmap Ive tried it countless times , I get the tga files but the lightmap doesnt seem to match the map. Probably because of some bad shaders I think? One last thing, Im using q3map_lightmapsamplesize on the big main textures of my map which looks very nice but Ive got a feeling it decreases my FPS. Can anyone confirm this does that? Try to add "-filter" to your light stage compile line. This will filter (anti alias) your lightmaps and takes "no" additional compile time. So I should use it in combination with -samples and ignore what Q3Map2 Wikibooks says? I'm pretty happy with it now but still needs minor tweaking, thanks ! Try it out, there's nothing to lose. I'm currently working on a map and use -samples 3 but I always only used -filter before. In the tests I did in the past -filter looked slightly better than -samples, although the q3map2 manual says otherwise. I don't know if using both at the same time is useful. Sometimes lowering the lightmap resolution helps, because you get fewer artifacts at the cost of sharpness. I wouldn't use -fast for your final compile. If you are getting artifacts without -fast, this is probably a problem with your lightmap resolution. Too much light information is lost with -fast for my taste. -fastbounce is not so much of a problem. You can also try to use -bouncescale to increase the intensity of bounced light. I like to increase -gamma slightly (around 1.2), push the dark areas further up with -bouncescale and compensate for it with -dirty (just as you do). I don't use -compensate because in the tests I did it made my lightmaps look flat. Regarding external lightmaps: yes, big lightmap data decreases performance. This is true for lightmapscale as well. Ok so I tweaked the settings a bit more and I must say I'm very pleased with the result. More suggestions about stuff is always welcome as I might tweak the light again at the final compile. Talking about the final compile, I found the image again someone posted about -fast in the Light stage. I might consider removing it in the final as the light compile is pretty fast anyway. Don't bother with -fastbounce, -fast is all you need (-fast turns on "fast" mode for everything in the lighting phase, you don't have to turn on the individual "fast" modes for the separate lighting calculations of the lightgrid or radiosity in addition to the general -fast switch). The picture with the -fast comparison was uploaded by me some years ago, I think here and in another mapping forum. -fast enables fast lighting for the first light stage and the bounce lighting, that's right. I prefer not to use -fast but -fastbounce for my compiles, even for WIP ones. This way the first lighting pass has high accuracy and does not lose information but the bounce lighting still compiles fast and accurately enough. I feel getting the first lighting stage before the bouncing is crucial for nice lighting, so I don't use -fast at all. It would give me a false impression how the final lighting looks and I'd have to decrease the intensity of my lights for a final compile. The small amount of time that's added to the compile process for not using -fast is rather insignificant in the quad core era, at least for my taste. I must say that without -fast and -fastbounce doesnt make that much of a difference, until you get closer and actually notice the difference, so yeah I like it, thanks for that ! The only thing discussed will be the item placement. The map itself will be already beta and early release candidate and possibly very soon final. I'll try to keep most of original (and play with original compile settings). Then we'll see how well it will get rated on LvLworld Currently I have my own map in progress (designing) and I need to make some details in it. It's named Schöna (you should see a thread over here in LEM), currently latest download is Alpha 4. Sorry for my late response but I've been pretty busy lately with personal stuff (medical , nothing too serious). Would be great if you could port it to Quake3 ! And I believe once it's released, TrueCombat Elite will most likely release it aswell with some adjustments which I dont mind tbh, it can always be better or more suited to the game it gets ported to. Now I've been fixing some small stuff like models/textures/shaders but it still needs a lot of work. Mainly in optimizing as its very poorly optimized. I've made an attempt with hint brushes but I had to delete them because they were so bad. If any of you are interested in taking a look, or checking for tips to optimize, I'd gladly take your advice in any of it and I'd be happy to upload the beta .map , files and pk3. Very interesting stuff there Obsidian ! I've read countless of tutorials about hint-skipping and optimization from various Q3 engine games but I never completely understand them but these sites cleared up some things, I thank you for that. For example you should build your map according to the blocksize. I do know how to use detail/structural brushes etc.. I also have a good idea about the hint brushes but almost 99% of the tutorials are about indoor maps whilest most maps I make are outside and have a rather more complexer layout than the tutorials ones. Also another thing that confuses me is that there are tutorials where they say fill a door/window with the skip brush and block both sides with hint brush. I basicly based my hint brushes on the last 2 lines which did improve FPS alot but at the center of the map which is the outside area of the map , its just a crazy... This spot can be seen from various locations but should also be blocked from some locations as it should be impossible to actually see the portal from there. Guess I should focus on fixing that mainly. EDIT: Soo , I decided to recopy over every brush from one map to another and fix it properly so it's better aligned to the blocksize , plus I can fix some bad brushes if there are, and make things more simplistic. You may not be able to do too much if you have a large open map with lots of windows. Hints aren't magic, if it's potentially possible for the player to see across the map from his current leaf node, the engine will draw all that he can potentially see. If you know you're going to make a fairly detailed map, you kind of have to plan for some of this beforehand. Clean geometry does reduce a lot of triangles. Making sure edges are properly mitred, removing T-junc, overdraw, and other optimizations can significantly speed things up. Hey Obsidian, I took your advice and I noticed that I already improved FPS quite a bit (Constant 500fps+ without that much details yet though (models, detail brushes), but I do feel a huge difference. My fault was that I didn't really look at the grids and just looked at the floor map of the original Ziba and build the walls on top of it wanting it to be as original as possible. I read about the special texture+shader specificly to block light but I dont want to use it for perfomance reasons as it adds extra geometry. I also read about the walls having to be mitred properly which I had done before but maybe I'm still doing it the wrong way. Might be solve-able with func_groups perhaps? I added some examples of it in here if you' d be so kind once again to take a look. Glad you solved the light leak. On the point you made about a caulk hull not being relevant in this case as both sides of the wall are textured. That's not exactly true. The wall there can be detail, and textured on both sides, or indeed the caulked faces of two detail brushes can be place on top of each other, that's all fine. You can (and in many cases should) place a structural caulk brush directly over the detail brush. With a simple flat wall like the one shown above it's very easy. As long as the structural caulk brush does not protrude out of the detail brush, it will not show in game, but it will help to block vis. Q3 maps are basically 3 maps drawn on top of each other. You have the real in game map, which is all detail brushes and patches. Then you have the entirely caulk map consisting of structural brushes. 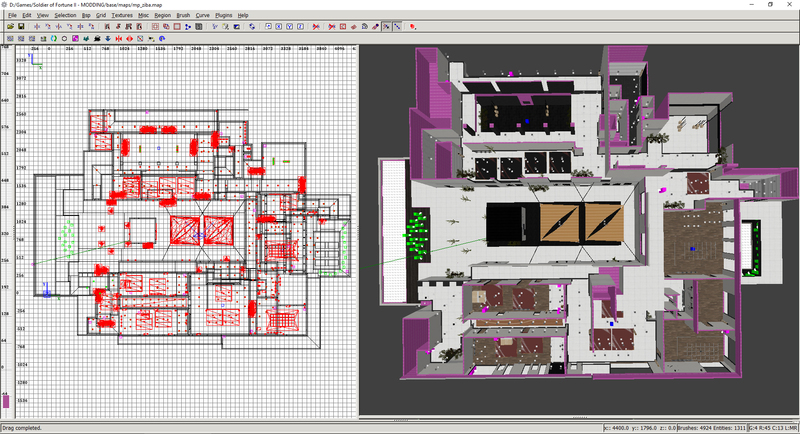 This is a simplified version of the detail map and fits fits a closely or as much as possible on top of the detail map. 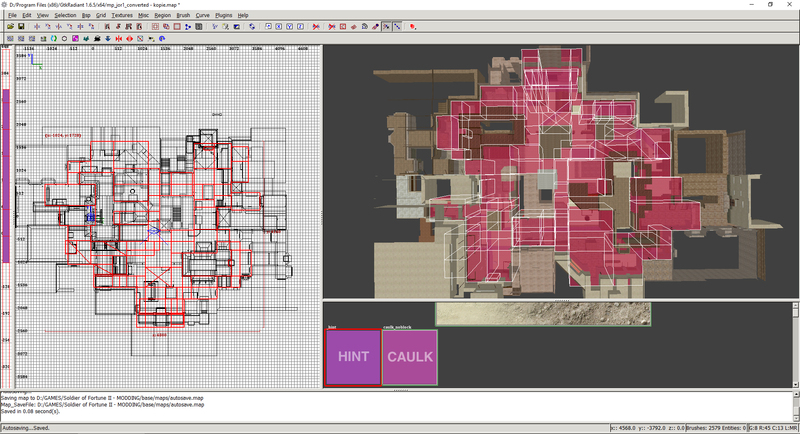 Quite often the blocked out alpha map forms the basis of the structural map. Finally the third map is you clip brushes for smoothing and simplifying movement, that sits over the top of the other two maps. Caulk blocks light and is invisible. A caulk brush can overlap other brushes as long as none of it's faces are visible (hidden behind other textured brushes). I have to say that sounds very interesting really. So for instance the wall I had light leaks on, I could make a big caulk wall over the 5 parts wall (border-wall-border-wall-border), make the 5 walls detail and make the caulk "z-fight"? And basicly do this over the whole map. 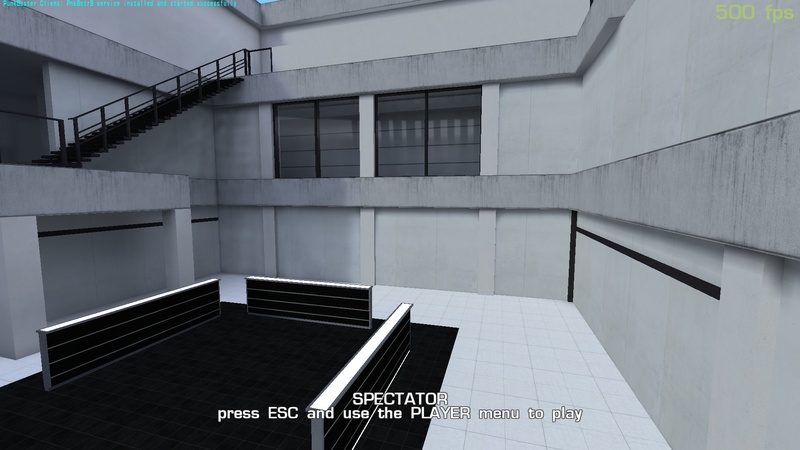 I thought I knew relatively alot about mapping by now, definitly since my first map mp_office (cs_office remake) but apparently I still have so much to learn. Speaking of the light leaks, they aint really fixed , it looks very messy if I make it func_group and the same lightmapscale as you can see a difference between the func_group and non func_group next to it. I'm really so confused now. So I tried selecting my structural brushes except the skybox and made it a func_group with lightmapscale 0.75 which does fix a few lightleaks but there are still big leaks. Edit: You know they say caulk everything that you cant see ingame or dont want to render ingame.. Thats what I do, caulk every brush that can't be seen but when I decompile an original SOF2 map it's like a complete different story. And no light leaks there eventhough I feel like my brushes are made the same-ish. What's on the outside of that wall? Does the map have a sky box all around it? If so, does that have to be the case? Original or industry maps (which tend to be older) will tend to be built in what many hobbyist mappers would describe as an incorrect manner. There are a many reasons for this: Pressures of time, older tool builds, less complex design, etc. Things evolve, work flow improves, the applications themselves improve. In many cases, these are luxuries the pro level designers did not have. Did you ever try to use the in game DooM3 version of Radiant? That would have made me go nuts trying to build DooM 3 with that bug ridden thing. And I guess that was the polished version for public release. Ahh no, I've only ever mapped for SOF2 with GTKRadiant 1.4 , since this year I switched to 1.6.5 with adding SOF2 compatibility. I've added 2 more images from in the map editor. Btw I also uploaded my beta .pk3 and .map on my dropbox account so anyone of you could try it out if wanted, but the problem is your game use common/caulk while SOF2 uses tools/_caulk so this might have to be edited (just auto replace tools/_ with common/ in the .map), aswell as our .shader file is in the shaders folder if you guys wanted check it out. I believe all textures that are in there are custom ones atm. Also I noticed there was a duplicate of my skybox in another map I had which had different sun angles and was overwriting my new skybox shader. Now I removed the other one and it's overall better but still some walls have the light leaks. I must be making my brushes faulty.